There’s something very special about a room full of people striving for gender equality. 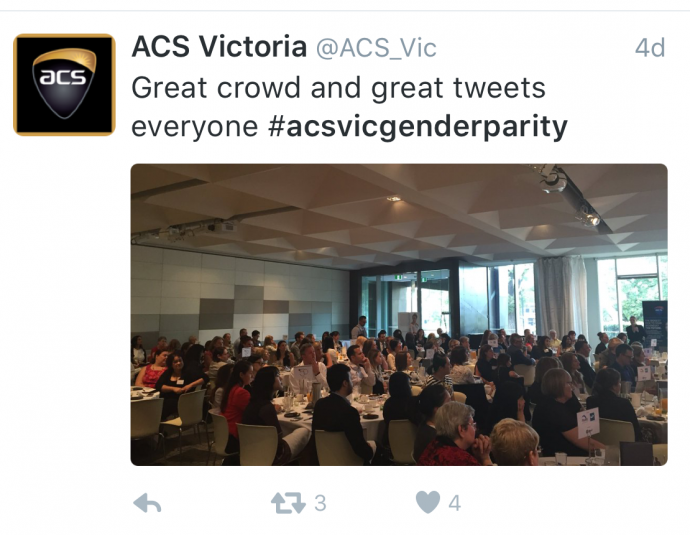 I was reminded of this at ACS Victoria’s gender parity breakfast held at Zinc at Federation Square. More than 140 early birds, including the state’s Small Business Minister Philip Dalidakis, came along and the energy for change was palpable. 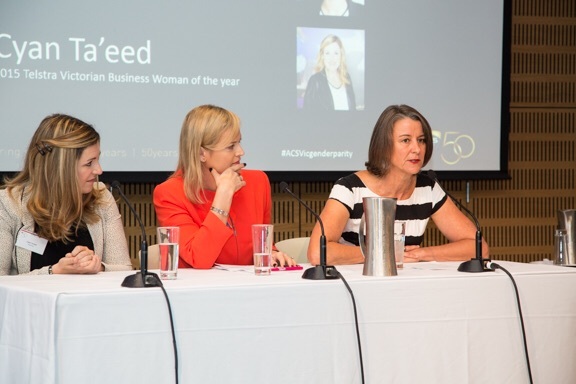 Engaging Women was invited to take part in a QandA panel, alongside Telstra Victorian Business Woman of the Year Cyan Ta’eed and a woman who has worked with some of the most talented business minds in the country, Jacinta Carboon. Before things kicked off, Cyan helped rid our brains of any morning fog with a welcome bucket… I mean cup… of coffee. 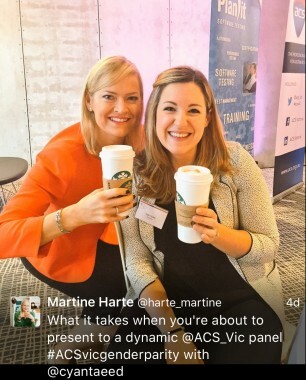 We then heard terrific insights from ACS Chairman Craig Horne and Chair of ACS Women in Victoria Maria Markman. 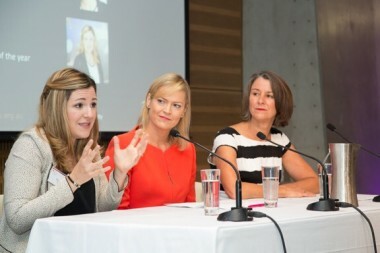 Next, it was the panels turn, the three of us pumped to share a modern take on issues including unconscious bias, sponsors, flexible working arrangements, the illusion of ‘balance’ and finding your platform. It’s widely accepted we no longer need to present the case for gender equality, men and women around the world agree it’s how we’ll say competitive in a disrupted world. We actually cannot afford to wait to engage female talent. The Grattan Institute reports, “If Australian women did as much paid work as women in Canada – implying an extra 6 per cent of women in the workforce – Australia’s GDP would be about $25 billion higher. Things are no different in the Information, Communications and Technology sector – It’s estimated the demand for ICT workers in Australia will increase by up to 100,000 over the period to 2020. Yes, we should be encouraging younger girls and women to explore this dynamic profession! There is so much opportunity. The ACS has produced an excellent report. The ACS says it’s prepared to take a lead role in addressing issues occurring in the primary and secondary education systems that discourage girls from engaging with ICT and computer science. This leadership came through at Zinc and the passionate audience of smart, engaged women and men seemed equally determined to make it happen. There’s no magic wand, it’s small steps but events like these produce tangible outcomes. It was fantastic to receive great feedback over Twitter during the event, thank you everybody! 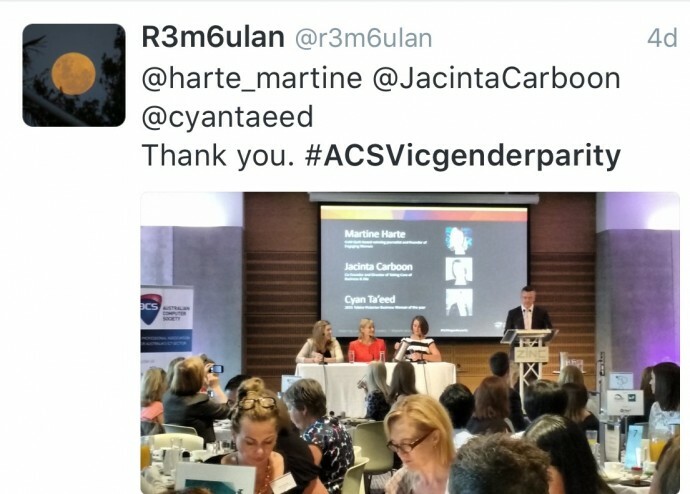 Thanks very much to ACS Chairman Craig Horne, Maria Markman and State Manager Michelle Bourke for inviting us and to the audience for saying such nice things. Want to learn more about the professional association for Australia’s Information and Communication Technology sector? 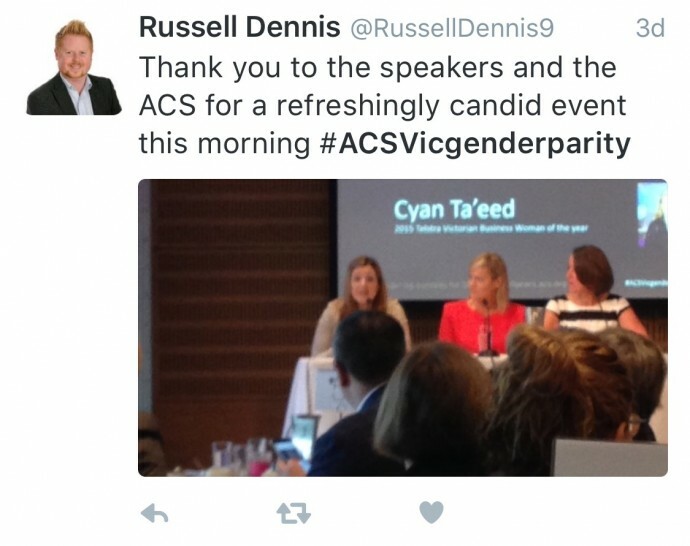 More about ACS here. A few people have asked me about Code Club Australia – a network of coding clubs for children aged 9 – 11 years. International Women’s Day is tomorrow, I’ll be reporting from a breakfast in the city. 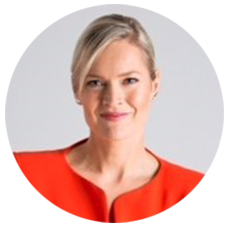 Tap this link to hear my interview with TWITTER MD KAREN STOCKS. Want to inspire your team or event, more about Engaging Voices here.